I’m definitely biased, but the UK is chock-a-block with some of the most fantastic castles in the whole world. As well as sheer numbers of castles, we’ve also got a tremendous variety – many of which have played a crucial role in British history. These incredible fortresses are spread evenly between the four countries which make up the UK – England, Wales, Scotland, and Northern Ireland. They range from the mighty Tower of London to some of weather-beaten strongholds of North Wales. There’s also the incredible bulk of Edinburgh Castle, in Scotland, which has helped define a nation – and the craggy cliff-edge ruins of Northern Ireland. The UK is full of spectacular castles which definitely merit your exploration. Here’s a low-down on some of the most incredible of all…. Dream of uncovering the secrets of English castles? Want to own a beautiful piece of English history? My book, Exploring English Castles, is filled with stories and more than 200 spectacular photos. 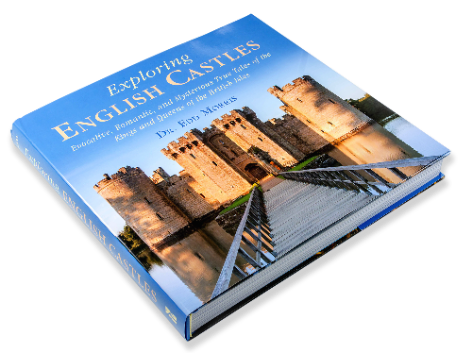 It’s a gorgeous book for anyone interested in English castles. The very first castles were built in England back in 1066 – when the Normans arrived and conquered the country. One of the first acts of the Norman invasion was to build the White Tower alongside the River Thames. Over the years, this has of course morphed into the Tower of London – one of the defining structures of my city to this day. Other castles were built in southern England, designed to protect the country from future invasion. One of the most formidable of all was Dover Castle – built alongside one of the narrowest parts of the channel, which separates England from mainland Europe. In fact, Dover Castle has acted as the ‘guardian of England’ for the best part of 1,000 years. Here’s a photo of the thick outer curtain wall, and the Great Tower at its heart. As well as protecting our nation during Medieval times, it also defended the UK during World War II – an extensive network of tunnels run under the castle, used by Allied troops to defend the UK in the event of invasion. Ominously, the tunnels beneath the castle also contain a nuclear shelter – once designed to help protect the UK against horrifying future conflict. Other castles in England were never built with such serious intention. Bodiam Castle, in the south of the UK, is a fairytale castle – a picture-perfect little fortification, surrounded by an idyllic moat. If it sounds a little too good to be true, that’s because it is! The castle was built in Medieval times, but it was built for show, rather than for defence. Its fairytale appearance was designed to impress visitors – rather than to protect the castle against attack. Some other castles in England have a truly mysterious past. One of my favourites is Beeston Castle in Cheshire. This is a mountainous little fortress which came into significance during the English Civil War. Beeston Castle, England. Credit: Paul Albertella, CreativeCommons (CC BY 2.0). However, the real interest is because – the stories say – King Richard II hid a vast treasure trove of gold coins somewhere within the castle. I’ve visited many amazing castles in England. Click here to discover more. . .! If you explore Wales well enough, you’ll discover some of the strongest fortresses of anywhere in the UK. Wales has always been geographically and culturally different to England. And border squabbles between the Welsh and the English – and the eventual capture of Wales by King Edward I – have resulted in a truly formidable array of fortresses. The strongest and the most magnificent of all these lie in the North of Wales – in Edward I of England’s so-called ‘iron ring’ of castles. These are some of the grandest fortresses of anywhere in the world. They all utilise some of the most technical, defensive designs which rendered them impervious to rebellion. Harlech Castle is a tremendous example of a truly formidable fortress. It gazes out across the rugged landscape of Snowdonia, with incredibly thick walls and a gigantic gatehouse – designed to keep out attackers. Beaumaris Castle is another incredible example. Beaumaris is perfectly symmetrical, and was designed as a ‘concentric castle’ – that is, a castle of ‘walls within walls’ – which would have made it virtually impossible to capture. Perhaps the grandest of all of Edward I’s castles was the tremendous fortress and walled city of Caernarfon. The vast, hour-glass shaped castle was surrounded by huge walls, which also wrap the small town within. It’s still an incredibly impressive destination – and the UK’s future Prince of Wales will still be crowned in this incredible place. Click here for more incredible castles of Wales . . . Undoubtedly the most famous fortress in the whole of Scotland, the shape of Edinburgh Castle dominates the skyline of the Scottish capital. Many of the most important moments in Scottish history – including the 1571 siege of Mary, Queen of Scots – have played out behind these vast walls. Edinburgh castle entrance – note the round sweep of the Half Moon Battery, mid-level of the picture. Besides this vast fortification, however, there are more delicate castles which can’t fail to capture the imagination. Dunnottar Castle is one of the UK’s most spell-binding castles. You’ll need to cross a narrow causeway to reach the grey-stone ruins of this sea-spattered ruin. Its picturesque remains are strewn across an isolated rocky islet. Dunottar Castle. Credit: JelleS, Creative Commons (CC BY-SA 2.0). Another castle in Scotland is unique in the UK – and unmatched in mainland Europe. Caerlaverock Castle has an unexpected, triangular shape that has intrigued historians for quite some time. It’s a beautifully photogenic little castle, though – as each corner of the triangle juts out into its reflective green moat. Click here to discover more amazing castles in Scotland. . . The all-conquering Normans didn’t let the expanse of water between mainland Britain and Ireland put an end to their conquest. Although it took them a little longer to cross the Irish sea, they soon began to shore up their power of the Irish isle by constructing motte and bailey castles, in their inimitable style. The bright red fishing-boats which trawl the Belfast Lough form an attractive contrast to the brown stone of the castle. Credit: Michael Kooiman, CC-BY-SA-2.0. The modern-day political divisions of the island have meant that many Northern Irish castles now form part of the UK’s formidable collection. Many of these fortresses are studded along the shoreline of the country – as the Normans were unable to penetrate much further inland. One of the most impressive of all is Carrickfergus Castle, situated on the bay adjacent to Belfast. This Norman fortress has a real maritime feel and, over the years, has withstood siege by the English, Scots, Irish and French. Discover more castles in Northern Ireland. . .
Castles weren’t a British invention – they were imported to our isle in 1066 by the all-conquering Normans. The Normans hailed from mainland Europe, and they built castles strategically to hold power over their newly-conquered lands. Despite being a foreign import, castles were enthusiastically adopted throughout the territories which make up the present-day UK..
Castles began to sprout upon rolling hills of England; the tumultuous borders of Wales and Scotland; and even penetrated into Northern Ireland, too. As Medieval times progressed, the role of the castle grew even more important. Castles became the centre of local power – the control over an entire local area radiated out from each fortress. They were also built to aggrandise their noble owners – conveying wealth and status in society. Until late Medieval times, castles were also built for defensive purpose – to withstand siege and to repel attack. However, the development of gunpowder in the 1500s changed warfare altogether. Castles faded from prominence – and were last used in the English Civil War as headquarters and garrisons for the tools involved. Enjoying Exploring Castles? Then Buy My Book! Love discovering the secrets of English castles? It's a gorgeous book for anyone interested in English castles. Discover the greatest UK Castles: from English fairytales to Welsh fortresses, and a selection of legendary Scottish castles to fire the imagination.